I'm pleased to inform Applause Ticket News readers that a new Off Broadway show called Cagney The Musical will begin previews at New York City's Westside Theater on West 43rd street in the Theatre District. The show is a production of the York Theater Company and originally played a "sold out" run in a limited engagement at the Theatre at St. Peter's in the Spring of 2015. 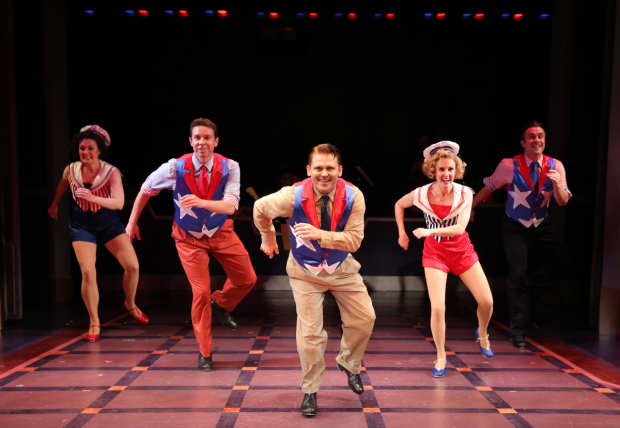 Cagney The Musical is a 6 character musical that stars Robert Creighton (who also wrote the Music & Lyrics). His musical writing partner is Christopher McGovern. The Book of this musical has been written by Peter Colley who tells us the story of James Cagney, the "rough and tough" star in hit movies of his time that include The Public Enemy and Angels With Dirty Faces and so many others. Although Mr. Cagney starred in many films he was a very capable stage "song and dance man" in the vaudeville era. Cagney The Musical follows the life of the legendary actor from the New York City streets to his incredible popularity in Hollywood movies. This musical has fantastic tap dancing all throughout the show that combines some original music along with musical classic tunes written by George M. Cohan that include, "Give My Regards to Broadway", "Yankee Doodle Dandy" and "Grand Old Flag". Characters in the show include movie stars Bette Davis, Bob Hope, Errol Flynn and Greta Garbo. Applause Ticket News readers and clients will have access to reduced prices for Cagney The Musical while the show is in previews prior to it's opening night reviews. If you think you want to obtain Cagney The Musical tickets for yourself, friends, family or business colleagues please contact our team at Applause Tickets when you have a few minutes to discuss. We'd love to help you anytime your plans include any of the fabulous Broadway and Off Broadway Shows whenever your plans include the theater. I hope you enjoyed this blog post from Applause Ticket News. Cheers and good luck to Cagney The Musical Off Broadway. Facebook Fans can see our page at Applause Theatre & Entertainment Service Inc.